Apollo 11, Apollo 11, this is Houston. Do you read? Over. Apollo 11, Apollo 11, this is Houston. We are reading you weakly. Go ahead. Over. Roger. Burn status report follows. DELTA-TIG zero, burn time 557, … VGX minus O.1, VGY minus 0.1, VGZ plus 0.1, DELTA-VC minus 0.390, fuel, plus 3 … 42. Over. 11, this is Houston. These residuals, do you have minus 0.1? … VGX minus 0.1, VGY minus 0.1, VGZ 1.1, and a burn time of 5 plus 57. Stand by, maybe the COMM will improve a little bit. Over. Apollo 11, this is Houston. Are you in the process of acquiring data on the burn? Over. Apollo 11, Apollo 11, this is Houston. How do you read? Reading you loud and clear, Houston. How us? Roger. Reading you the same, now. Could you repeat your burn status report? We copied the residuals and burn time, and that was about it. Send the whole thing again, please. It was like—like perfect! DELTA-TIG zero, burn time 557, shaft value on the angles, VGX minus 0.1, VGY minus 0.1, VGZ plus 0.1, no trim, minus 6.8 on DELTA-VC, fuel was 38.8, LOX 39.0, plus 50 on balance, and we ran an increase on the PUGS, NOUN 44 showed us in a 60.9 by 169.9. Roger. We copy your burn status report. And the spacecraft is looking good to us on telemetry. Everything looks good up here. 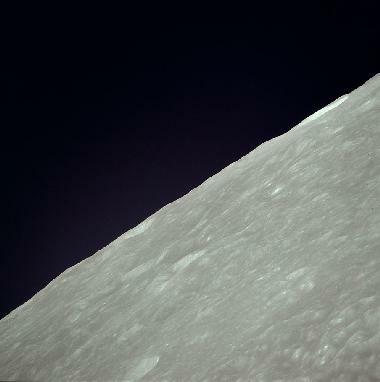 Apollo 11 is getting its first view of the landing approach. This time we are going over the Taruntius crater, and the pictures and maps brought back by Apollo 8 and 10 have given us a very good preview of what to look at here. It looks very much like the pictures, but like the difference between watching a real football game and watching it on TV. There's no substitute for actually being here. Roger. We concur, and we surely wish we could see it firsthand, also. We're going over the Messier series of craters right at the time, looking vertically down on them, and Messier A we can see good sized blocks in the bottom of the crater. I don't know what our altitude is now, but in any case, those are pretty good size blocks. Okay. Just roughly, it looks like you are about 120 miles or 130 miles right now—make that 127 miles. We're approaching PDI point now. Over. We're going over Mount Marilyn at the present time, and it's ignition point. Roger. Thank you. And our preliminary tracking data for the first few minutes shows you in a 61.6 by 169.5 orbit. Over. 11, Houston. During your SPS burn as played back on tape down here, we've observed the nitrogen tank Bravo pressure in the SPS system dropping a little bit more than we anticipated. It's holding steady right now. We'll continue to watch it and keep you posted if anything comes up. Over. And Boothill, Duke Island, Sidewinder, looking at Maskelyne W, that's the yaw round checkpoint, and just coming into the terminator. At the terminator it's ashen and gray. As you get further away from the terminator, it gets to be a lighter gray, and as you get closer to the subsolar point, you can definitely see browns and tans on the ground, according to the last Apollo 11 observation anyway. Roger, 11. We're recording your comments for posterity. Did somebody in the background—do they accuse us of being compromisers? Huh! And landing site is well into the dark here. I don't think we're going to be able to see anything of the landing site this early. Apollo 11, this is Houston. When you have a free minute, could you give us your onboard readout of N2 tank Bravo, please. And we'd like to make sure you understand that ever since you stopped thrusting with the SPS, the temperature in this tank has remained steady. Over. Make that the pressure has remained steady. Roger. We understand tank pressure has stayed steady. Thank you. Roger. We're showing the N2 tank pressure and the tank Bravo to he 1960, something like that, and Alfa is, oh, about 2250. Over. Roger. We show 2249 in Alfa and 1946 down here. Houston, Apollo 11. How about coming up with some roll, pitch, and yaw angles in which to stop this so called ORB RATE that I'm doing. We'll have them for you in a minute, 11. Okay. And time to stop also, please. Roger. We show you, in the flight plan, staying in orbital rate until about 79 hours 10 minutes. Do you have some particular attitude or reason for wanting to go inertial? Over.